American Furniture | Folk Art Collection | Charles P. Fisher Estate | Skinner | Skinner Inc.
Skinner is pleased to offer an exceptional, single-owner collection, featuring a small group of objects gathered over more than forty years by a Midwestern couple. An Ohio Collection of American Folk Art is a truly singular find, as its contents have remained largely undiscussed, unpublished, and unseen – until now. This collection reflects the personality of the two collectors and the playfulness inherent in much American Folk Art, as well the collectors’ deep connoisseurship of this style of art. Color, pattern, patination, proportion, geometry, clarity of design and, of course, condition, are the words that best characterize this important collection. 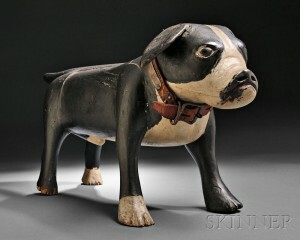 Highlights include several carved wood Folk Art objects, including a Rare Painted Wood Carving of a Boston Bull Terrier by famed bird-carver Augustus (Gus) Wilson, 1864-1950 (Lot 33, estimated at $125,000 to $175,000). Highly favored by the consignor, this life-sized, carved, standing figure painted black, white, and red, features an original brass-studded red leather collar and appears to be a unique work by the artist. Another prized carved animal from this collection is a Folk Carved and Painted Pig Sculpture (Lot 16, $50,000 to $75,000). Once, perhaps, a child’s ride-on-toy, this standing wood figure has wonderfully detailed carved ears, delineated eyes and snout, a curled tail, and an applied wool saddle blanket. Also available from the same collection is a charming Vermont Farm Landscape, c. 1915 (Lot 13, $15,000 to $25,000). 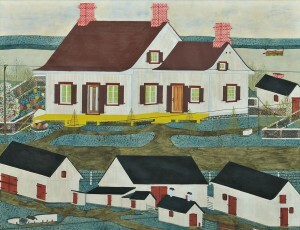 Depicting a town near the Canadian border, this meticulously painted work is a superb example of folk landscape painting. Furniture offerings from the Ohio Collection of American Folk Art include a Queen Anne Red-painted Tiger Maple Tea Table (Lot 35, $50,000 to $75,000) from Southeastern Massachusetts, c. 1750-80. In an extraordinary state of preservation, this oval top table retains its original red paint. The table was exhibited at Winterthur, and is illustrated and discussed in the companion book: Harbor and Home: Furniture of Southeastern Massachusetts 1710-1850 by Brock Jobe. A colorful Pine Blanket Chest from Schoharie County, New York (Lot 15, $15,000 to $25,000), adorned with delicately painted cabbage roses, is another highlight of the collection. Stephen Fletcher, Director of American Furniture & Decorative Arts, describes Charles P. Fisher as a man of many talents: among them, a tenacity for researching his family’s history. The Estate of Charles Paine Fisher encompasses many of the important and cherished items that passed down through Fisher’s family – descendants of Robert Treat Paine, a signer of the Declaration of Independence from Massachusetts and a prosecutor in the Boston Massacre trial. Revolutionary history lives on through a small, but significant collection of silver. 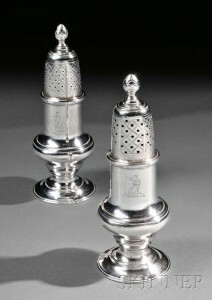 Among the most important is a pair of Paul Revere, Jr. Silver Casters, Boston, 1772 (Lot 69, $75,000 to $150,000). Revere, a silversmith and fine engraver, sold these casters to Robert Treat Paine, as recorded in an entry in Paul Revere’s wastebook, dated January 9, 1772. The Massachusetts Historical Society, which now owns this wastebook, made confirmation of this transaction possible. As well, the Fisher collection includes early furniture, including an exceedingly rare Federal mahogany and eglomisé secretary desk attributed to Thomas Seymour (Lot 186, $100,000 to $150,000), one of only a handful of such desks known to be in existence. Every aspect of this piece reflects Seymour’s legendary attention to detail and precise construction. Also to be offered is an early 19th century Classical Gilt Gesso Convex Mirror, featuring an ebonized carved eagle with outstretched wings (Lot 445, $8,000 to $12,000). As shown in a 19th century photograph, this mirror once adorned the parlor at 87 Mount Vernon St., Boston, a building that is now the headquarters of the Colonial Society of Massachusetts. 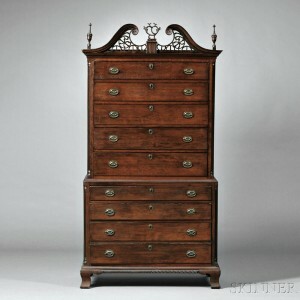 In addition to the single-owner collections, Skinner will auction a Cherry Carved Scroll-top Chest-on-Chest, likely originating from Granby, Connecticut, c. 1802 (Lot 104, $40,000 to $60,000). The piece is in untouched condition and features original, unbroken fretwork that is said to contain the initials of the original owner. An identical chest-on-chest resides in the Yale University collection. According to family tradition, the two pieces were originally made as a wedding gift. Skinner will offer an oil painting attributed to Massachusetts artist Sturtevant J. Hamblin (1806-1873), Portrait of Young Girl Seated in a Rocking Chair with Her Dog (Lot 126, $30,000 to $50,000). A fine example of naïve portraiture, the painting is of a girl, possibly a member of the Fellows family of Exeter, New Hampshire. Previews for the auction will be held on Thursday, October 24, from noon to 5 P.M., Friday, October 25, from noon to 8 P.M., and Saturday, October 26, from noon to 5 P.M. Illustrated Catalog #2680B is available from the Subscription Department, at 508-970-3240, or from the Gallery. Prices realized will be available online, at www.skinnerinc.com, both during and after the sale. The Skinner website enables users to view every lot in the auctions, leave bids, order catalogs and bid live, in real-time, through SkinnerLive! This entry was posted in News and tagged American furniture, American Furniture & Decorative Arts, american painting, american textiles, Americana, animal carving, antiques, Boston Massacre, chippendale, Colonial Society of Massachusetts, declaration of independence, decorative arts, federal furniture, folk art, marine art, massachusetts, needlework, Paul Revere, portrait, Revere silver, Robert Treat Paine, Stephen Fletcher, Sturtevant Hamblin, Thomas Seymour, Vermont by Skinner. Bookmark the permalink.